Did the NCAA Cause Itself Future Problems by Making the Right Decision? After he led the LSU Tigers to a win over the South Carolina Gamecocks on October 10th Sophomore running back Leonard Fournette announced something on live television that most likely made the NCAA cringe. Fournette stated that he wished to auction his game-worn jersey and have the proceeds donated to those residents of South Carolina who were victims of destructive flooding caused by historic rainfall.1 Many rightfully applauded this tremendously generous gesture. The few who didn’t were probably NCAA employees who were too busy scrambling to make the common sense, yet critical, decision to allow this auction to occur. This zero value concept is merely one of the many that comprises the NCAA’s stance that college players are amateurs who are not entitled to compensation from revenue that is generated through their actions. 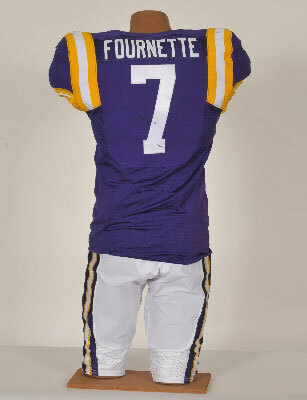 However, the NCAA’s decision to allow someone to presently purchase a LSU jersey with the name “Fournette” on the back is bound to create some wonder of what the future holds. This is particularly true in light of the litigation that has and will be resolved in the years to come. With all of this information in mind, it’s interesting to think about how much longer the NCAA will be able to maintain its amateurism argument. To add to the mix, the auction for Leonard Fournette’s game-worn jersey started at 8 a.m. ET Saturday November 7th and will end Monday November 9th at noon ET.13 The opening bid for the jersey plus a game used South Carolina helmet signed by their now retired coach Steve Spurrier, and LSU Coach Les Miles autographed LSU helmet was $7,000.14 This auction proves that there are good people, like Leonard Fournette, who are willing to help others in need. But it also proves that Fournette, with his image, name, and likeness, has a value that does and will continue to produce profits. It may be time for the NCAA to concede that point and prepare for the long road ahead. Leonard Fournett’s jersey from the South Carolina game closed with a final bid of $101,000, according to a tweet from LSU. Joseph Tangredi is a second year student at Fordham University School of Law and a staff member of the Fordham Intellectual Property, Media & Entertainment Law Journal. He is a long time suffering sports fan as his New York Jets constantly find ways to disappoint.